First Line: It was Tuesday, the day before Christmas, and I wasn't expecting visitors. I've been eagerly awaiting this novella since I heard author Craig Johnson talk about it at an author signing last summer. It was worth the wait, not because it's a rip-snorting little mystery that ties in with all the other Walt Longmire whodunits, but because it says so much about the heart, the compassion, and the determination of the memorable characters Johnson has created. Readers get to see what these folks do when they're not out solving crime-- and it's every bit as enthralling as those mysteries. A woman intrudes on Sheriff Walt Longmire's Christmas Eve tradition of reading A Christmas Carol, and with every question she asks about former sheriff Lucian Connally, she bears an uncanny resemblance to the ghost of Christmas past. Walt doesn't recognize her even though she seems to know him-- and she insists that she has something that must be returned to Lucian. With his daughter and his undersheriff in Philadelphia, Walt is at loose ends, so off to the Durant Home for Assisted Living they go. Lucian is several tumblers into a bottle when they get there, and he swears he's never seen the disappointed woman before. Dejected, she whispers, "Steamboat," and the story she begins to tell whisks them all back to Christmas Eve in 1988 and a record-breaking blizzard... to Walt's first year as sheriff... and to a terrible crash that left three people dead and a little girl who had only one chance for survival: being flown to a Denver hospital in an old wreck of a decommissioned plane flown by an alcohol-fueled World War II veteran. As Johnson says in his acknowledgements, "sometimes it's not so much about the suspense of killing characters off in a book, but rather, of trying to keep them alive." Trying to keep these characters alive on that plane in that weather is a nail-biter for readers. Johnson keeps us nibbling and chewing by carefully setting the stage-- pinning our hopes on that rickety old plane named for an animal that anyone would recognize if they've seen a Wyoming license plate. Once the stage is in place, the characters climb on board, and these characters who place a little girl's life above their own? Well, each of them made my eyes well up with tears and a lump form in my throat. I wanted to hug the stuffing out of all of them-- and I wanted to climb on board, too. This tightly woven tale is laced with nerve-wracking action and lashes of Johnson's trademark humor. Spirit of Steamboat is a perfect, emotionally satisfying story whose re-reading may turn into my own Christmas Eve tradition. 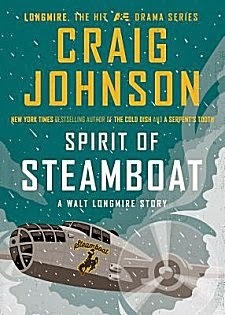 If any of you have hesitated to read Craig Johnson's books, this is the absolute best way to test the waters. If Johnson doesn't have you hooked in the short 160 pages of this book, then it's just not meant to be. But I honestly can't believe that's possible. So have you read the other Craig Johnson books? I am probably the only Wyomingite left who has not. You have me hooked now. I will pick this one up, and maybe get to attend a book signing if I am lucky. Thanks for the review. You're welcome, Judy! And as for Johnson's other books? I've read every single one of them AND the digital short stories. I love them all, and I've been an ardent Craig Johnson fan since his very first, The Cold Dish. All this, and his author events are marvelous. He's a treasure! Cathy - In my opinion, it's hard to go wrong with a Longmire story. It really is. I love the characters, I like Johnson's writing style, the whole thing. Glad that this one lived up to the others. It's a very special story, Margot. I'm so glad that you're a fellow Johnsonite!